Northants have added club legend David Sales and former England batsman James Taylor to their coaching line-up for the forthcoming season. Sales will join as part-time batting coach, having scored more than 22,000 runs across all formats for the County during his career as a player. Taylor, who was forced to retire aged just 26 due to a serious heart condition, will assist the Northants coaches on a consultancy basis for the Royal London One-Day Cup competition. In his role as a pundit for Sky Sports, he famously labelled the Northants team ‘The Units’, due to the size of some of the players, as they went on to win the NatWest T20 Blast last season. On his decision to work with the County, Taylor said: “I’m excited. They are a skilful side who have clearly done well in one-day cricket in the past. “I spent a bit of time commentating at the County Ground last season and am keen to offer up my expertise to the squad. Northants head coach David Ripley added: “James has a fantastic 50-over record, averaging over 50 which is obviously outstanding. “It’s very unfortunate for James not to be playing anymore, but it’s great to see his desire to still be involved with the game. 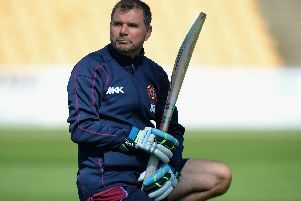 And on the appointment of Sales, who played more than 500 matches for Northants, Ripley said: “David has been working part-time with the batters since January, focusing on improving more of the technical aspects of their game.